Your Health Matters: I finished the 5K, but now I’m sore. Mat and I after finishing the 5K! As some of you may remember reading, I started a New Year’s resolution to finish a 5K. (If you don’t remember, you can see those posts here, here, and here). 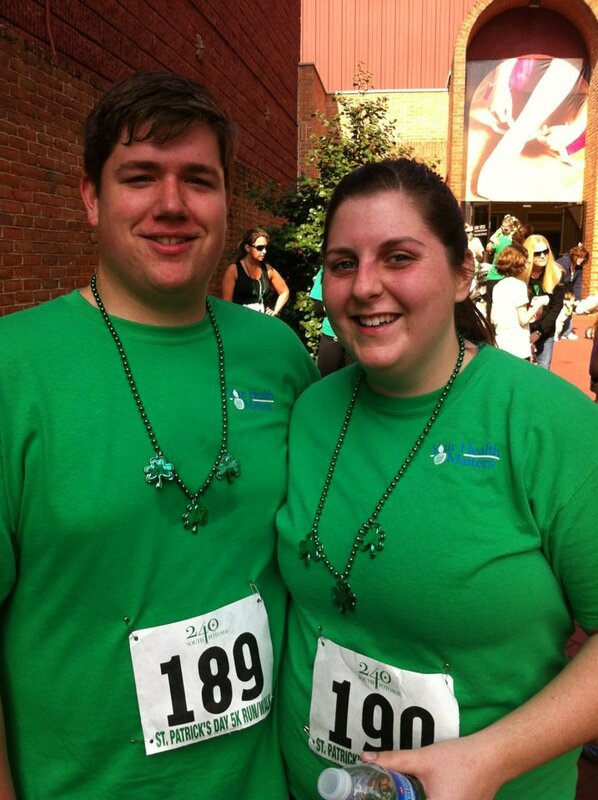 Well, on March 17, I finished the St. Patrick’s Day “Run for Your Luck” through Hagerstown! It felt great to finish the race. I didn’t run the whole time – there were a lot more hills than I expected – but I finished. My legs felt like jelly and I got more side stitches than I care to admit, but I’m still proud that I accomplished my goal. I knew that I wouldn’t be doing myself any favors if I sat down immediately after finishing, as much as I wanted to. I walked around for a little bit, and when I got back home, I took my dog for a short lap around the complex. I was thinking that doing this would help me not feel as sore the next day. Well, on Sunday, I could barely walk. My calves were tight, it hurt to flex my tibialis anterior (that muscle that runs down the front of your leg), and I discovered the muscles on the side of my hips and how much you use them when you walk. So, where did I go wrong? I didn’t immediately become sedentary, and I’ve been training for this 5K–I didn’t just overexert myself out of the blue. If you frequently exercise, you probably know right away what I didn’t do. Hamstrings – While standing, place the heel of the foot on a stool and lean over your thigh while pulling your toes toward you. Quadriceps ­– Lie on your stomach. Bring your foot toward your buttock and grab your foot with the same hand (so, right leg and right hand, or left leg and left hand). Pull your foot toward you. Hip Flexors – Begin half kneeling. Bend forward at hip and rest chest onto front leg. Steady yourself with arms to each side. Press the opposite hip toward the floor. Calves – Stand facing the wall. Stagger your feet, one foot in front of the other with toes pointed straight ahead. Keeping the back heel down and leg straight, shift weight forward while bending your front knee slightly. This stretch should be felt at the top of the calf. Then hold for five seconds..
Iliotibial band – Stand with one shoulder against the wall. Cross the opposite (outer) leg in front of the other. Lean into the leg closest to the wall. Hold for a few seconds. Repeat with the opposite side. This stretch should be felt on the outer thigh on the leg closest to the wall.